ICSYC 2018 – The Purple Team posed for a photo during the Survivor Competition! *PLEASE SEE FORMS AND APPLICATIONS TAB TO PRINT REGISTRATION INFORMATION, CAMP STAFF APPLICATIONS, HEALTH FORMS, ETC. 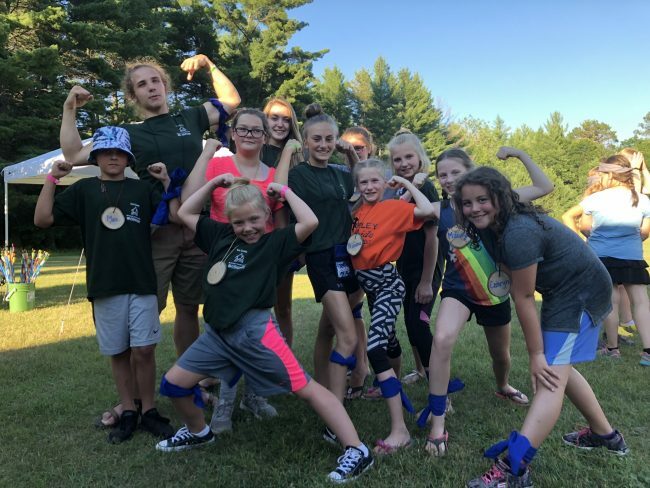 Iron County Summer Youth Camp is an opportunity for youth in grades 3-5 from throughout Iron County to spend a week getting to know each other better, build stronger, and creating new friendships. It also creates opportunities for our eighth grade and high school students to step into leadership roles and serve as role models and mentors to the youth placed in their care. Parents trust us with planning a safe learning experience for their kids. We take that seriously and work hard to create an experience that the kids will remember for a lifetime. We know this is an important program because year after year community members and organizations tell us through generous donations that allow us to offer this experience to youth at a low cost. Thanks again for your support this year. We couldn’t do it without you! We look forward building life long memories for our campers again in 2019. If you have any questions about enrolling your child in Iron County Summer Youth Camp, please call Neil Klemme at 715-561-2695. **We will add to this list as donations come in through out the year. THANK YOU to all of the individuals and businesses that continue to support our programs each year.